So that's another season of highs and lows almost over. It may have been fairly comfortable in the end, but in one way it was a repeat of last season. In both Pools struggled for much of the season then had a golden month towards the end in which they racked up the points which ultimately saved them before being good enough in their remaining matches to finish above two poor relegation-bound teams. The tough run-in faced by Pools (all of the last four matches being against top-six teams) would have been a nightmare were it not for this season's golden month, as has been proved by the loss of the first three of those games, with one still to play. So having passed his first test, we now have to see what Craig Hignett is like at hiring and firing when he produces his first retained list and then tries to find replacements for some of them. Elsewhere in this issue Solihull Moors FC gets a mention for being newly promoted to the division below Pools, and for having a great name. Anyone familiar with the west midlands know that there isn't any moorland within about 50 miles of Solihull, so we just had to follow this up. It turns out that Solihull Moors is another Rushden and Diamonds job. Just as Rushden merged with Irthlingborough Diamonds, so Solihull Borough merged with Moor Green and also merged their names, because Moor Green were known as The Moors. Which sorts that out, except that Moor Green is just along the road from Solihull. It turns out that Moor Green was Mor Green in mediaeval times, which is nothing to do with wild uplands, because 'mor' is the word that gives us 'mire' and 'marsh'. And since Solihull is thought to have originally been Sol Hyll, or 'muddy hill', Solihull Moors could equally be called Muddy Hill Bogs. Not such a great name now, is it? 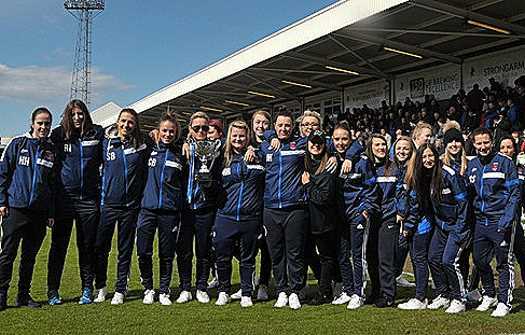 The Pools Ladies' team, having won the championship of their league, proudly show off their trophy at the Vic. Congratulations to them, and we hope that the next trophy they win isn't so dazzling that the lady carrying it needs to wear sunglasses. No doubt a way will be found, as usual, to avoid any prosecutions of those who caused it and covered it up. Finally, thanks to all our contributors for another season of entertaining stuff. We hope they and all our readers have a good summer, and that any pre-season excitement doesn't quickly turn to disappointment - as usual! See you all again in August.